this was the second show in a six month period that i had to stay behind after our opening set to support the headliner in some form or fashion – i had stuck around to tech for vonda sheppards’ guitarist the last time, and this time i was sticking around to tech for richie furay. i was half afraid that i might be giving dan a complex by not coming over to the washington house with the band for dinner after our set. 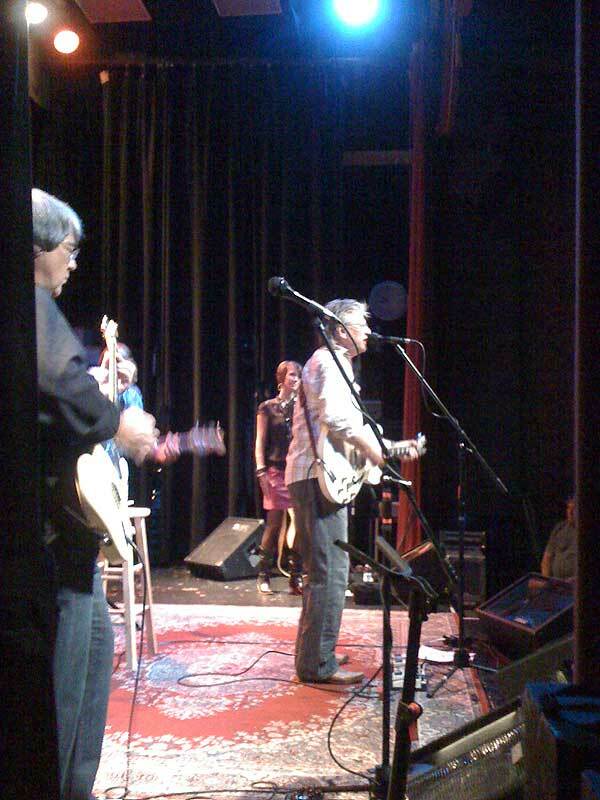 the last time richie and company came to sellersville, i had tried to get jd malone on the bill, but we ran into backline issues, in terms of trying to get what we had approved. i’m not sure why it was any easier to get dan’s gear approved than it was to get jd’s stuff approved, but i’m not entirely convinced that it wasn’t due to the fact that i had just been in richies’ company the week before on the loggins and messina dates in NY and NJ, and had been able to talk to him about it in person. at any rate, between richie, daniel faga and myself, we got everything squared away so that there were no surprises on the day of the show. while the poco guys flew home after the jones beach show, richie picked up where their leg of the tour left off with his own band and started down the east coast. richies’ band is largely a family affair…richie’s daughter and his guitarist’s son are both in the band, so it’s fair to assume that they travel well – or, depending on ones’ personal experience, maybe that’s the last thing you assume, i don’t know…but they seem to genuinely enjoy one anothers’ company. i had seen richie once, playing with a church band in manhattan, and hadn’t seen him since…in the time since, he had released a double live album, and was enjoying something of a resurgence as a live act, as well – as i had mentioned, this was the second time in two years he had been at sellersville, so he was certainly doing his part to get out and about. the one thing that would be different about this show, as per the rumors, is that they were opening the show…opening the show…with the song “crazy eyes”. the song is nine minutes long, with movements and a pedal steel solo here, a four measure banjo break there, a guitar solo on the tag…and if you listen very carefully, you’ll hear a kitchen sink fly by in the middle of a verse about four and a half minutes in. it’s probably the most ambitious single piece of music they ever recorded, and – while i’m certainly not sure about this – i’m pretty sure they never played it live. richie left the band not long after the album was finished, so i don’t think the opportunity to play it ever existed. but richie and company walked out onto the stage, picked up their instruments, and slammed right into it, cold. now, you might say to yourself – where do you go from that? after you pull something like that off, what do you do next? and you’d be somewhat justified in wondering that, too. but i have to tell you – richie is one of those guys that, after being in the same room with him for five minutes, you’re immediately in his corner, rooting for him. he’s such a genuine, sincere guy and he pulls the audience into his circle so quickly, that it wouldn’t matter if they peaked on the first song. but he has such a rich history that, by the third or fourth song, you’ve forgotten just how great crazy eyes was…by then, he’s either into something from the poco catalog, or one of his buffalo springfield songs, and you’re rolling with the punches. as of the date of this show, richie was 65 years old – and he had more energy than some people half his age in the same position. it was truly an amazing thing to see.